Tune in to WLS-TV, ABC 7 this morning at 11 a.m. for a cooking segment with Evanston pride and Community well-being as main ingredients. 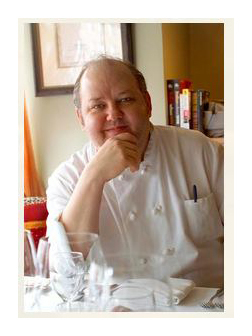 As the proud Chef/Owner of Evanston’s premier restaurant Oceanique (505 Main St., Evanston, 847-864-3435), Mark Grosz joins dozens of other Evanston businesses in their support of the Evanston Works Together project. For the demonstration Grosz will be preparing Warm Day Boat Sea Scallops, a restaurant favorite and staple. Oceanique has called Evanston home for the past 25 years and with a recently renewed lease and a completely renovated space, Oceanique is ready to embark on 10 more years in its amazing city. Evanston has provided Oceanique with a sparkling and lively social scene within which the restaurant has thrived. Evanston Works Together is an organization designed to funnel Evanston resources directly back into the community. This month Evanston businesses will encourage Evanstonians to shop and eat locally. Five percent of all sales made on each Tuesday in August will be donated to Evanston organizations set on making a difference. The donations will be directed into programs designed to encourage employment and financial stability for Evanston residents. Evanston organizations such as Connections for the Homeless, the YWCA Evanston/North Shore, and Youth Job Center of Evanston, will provide free financial literacy, job-readiness, and job training programs to those in need. What better way to support Evanston then to enjoy its vibrant and unique local business community. This brilliant collaboration will impact the Evanston community both socially and economically. Come make a difference, shop and dine in Evanston every Tuesday.